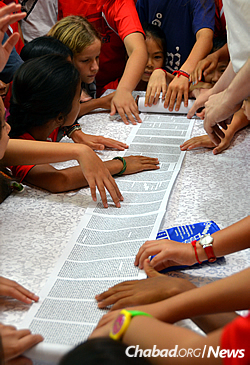 Children in Cambodia's capital city of Phnom Penh are shown a model Torah scroll. 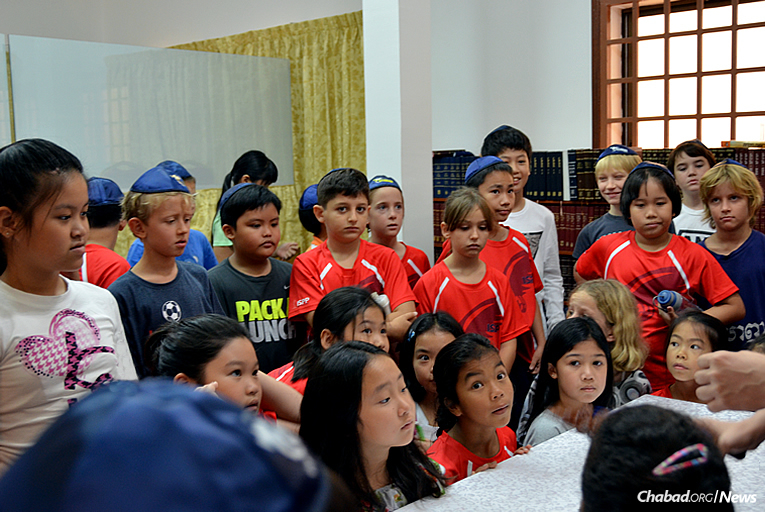 They are gathered at the Chabad Jewish Center, directed by Rabbi Bentzion and Mashie Butman. 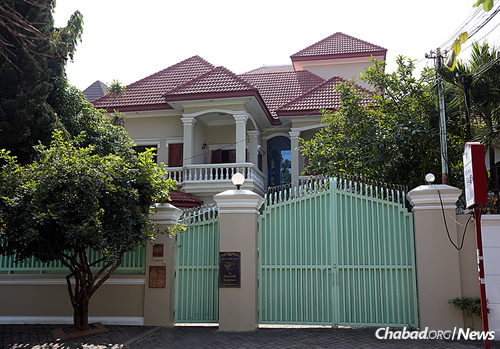 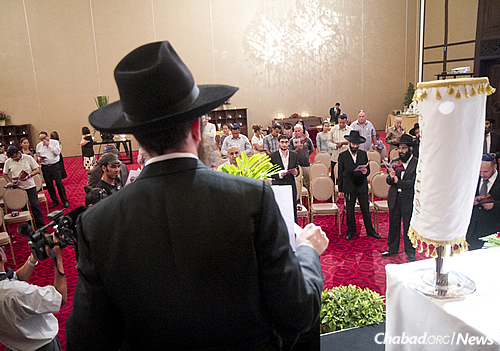 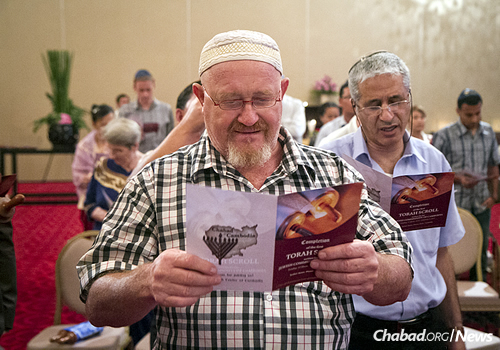 This High Holiday season, residents of the small Jewish community in Cambodia—and those who are visiting—will have one more reason to celebrate: It will be their first year in a brand-new, eight-story Chabad center. 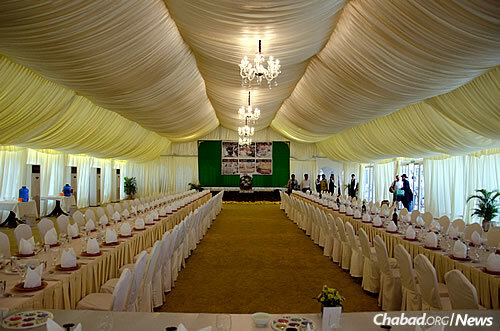 The rabbi expressed his hope that the social hall would be ready to host the 120 guests expected for Rosh Hashanah feasts, but he has also made arrangements to celebrate at the nearby Himawari Hotel, just in case. 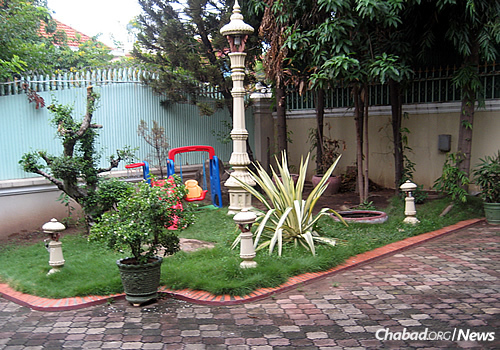 Located in the Daun Penh district’s Chaktomuk commune—minutes away from the confluence of the Mekong and Tonlé Sap rivers—it will be a short walk from the Chabad House to the riverfront for the traditional Tashlich prayers, the ceremonial casting of sins into the water. 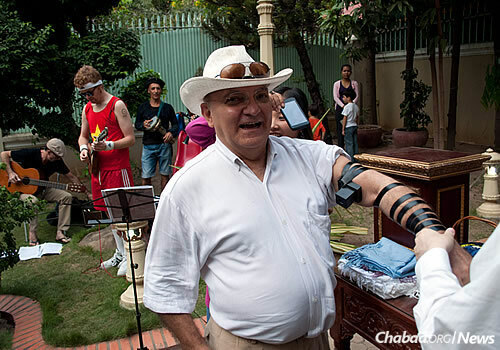 Noting that the Tashlich procession and accompanying shofar-blowing is one of the highest-profile Jewish celebration in the predominantly Buddhist country, the rabbi says it has become increasingly popular with local Jews and has even led to some surprising revelations. 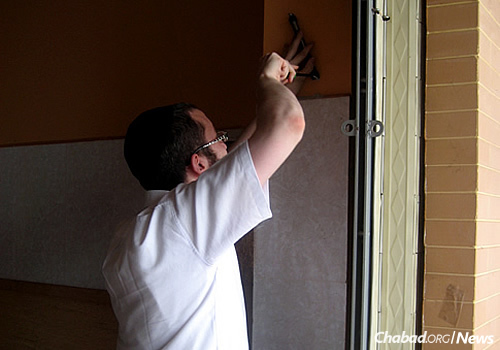 Rabbi Butman hangs a mezuzah on the door of the new Chabad building. 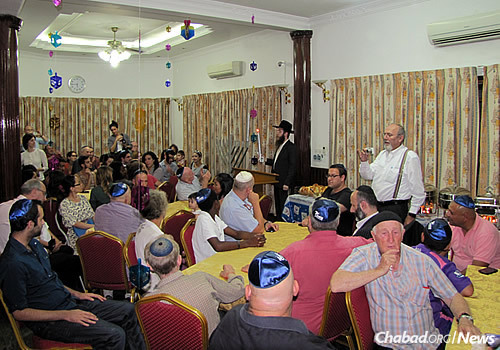 Discussing the eclectic crowd that forms his community, the rabbi notes that they represent a cross-section of the Jewish nation. 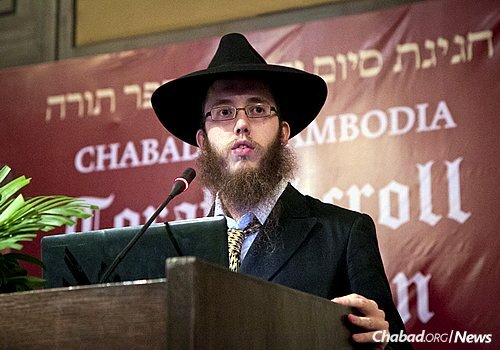 “We have judges and lawyers who are here for the ECCC [Extraordinary Chambers in the Courts of Cambodia] war-crimes court [Khmer Rouge Tribunal], backpackers, retirees who are stretching their savings to remain in the balmy weather, business people and all others,” says the rabbi, who conducts the traditional Hebrew services in English. 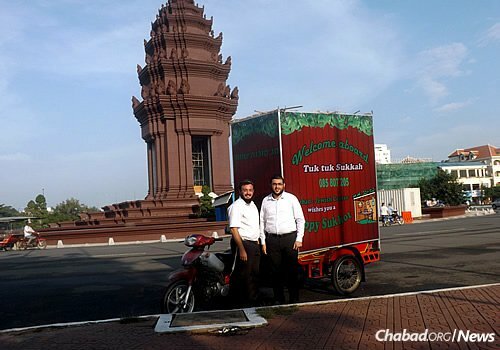 Driving a mobile sukkah around Phnom Penh, which blends into the slew of motorbikes and other open-air vehicles in the city. 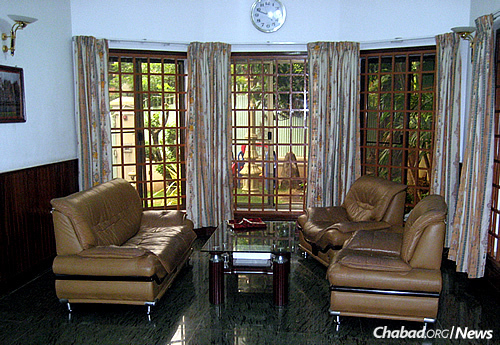 Over the years, he says the country has modernized, skyscrapers and shopping malls have taken the place of shanty towns, and acquiring “luxuries” like aluminum foil is no longer the challenge it once was. 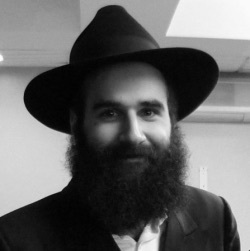 Yet the biggest change for him has been the increase in Jewish engagement. 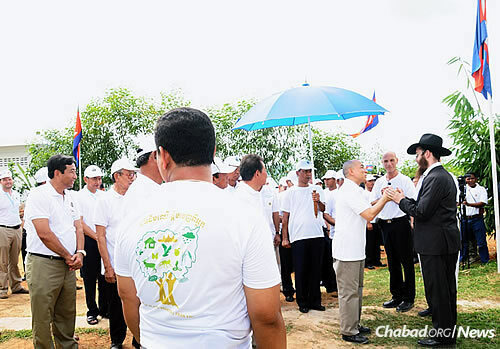 The rabbi has become familiar with Cambodian leadership since he arrived in 2009. 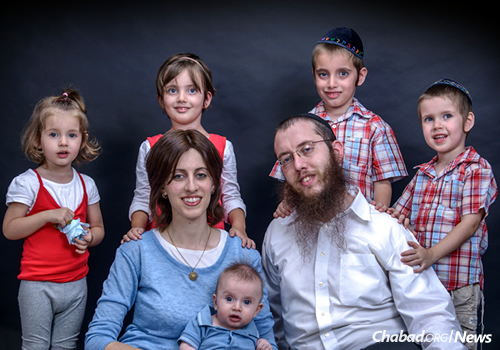 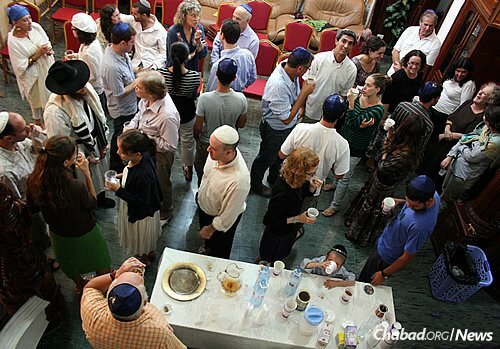 People of all ages, including many young professionals, participate in social events with Chabad. 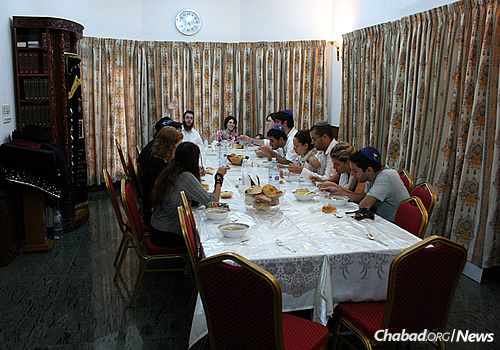 Enjoying a kosher meal during the week at the Butman residence. 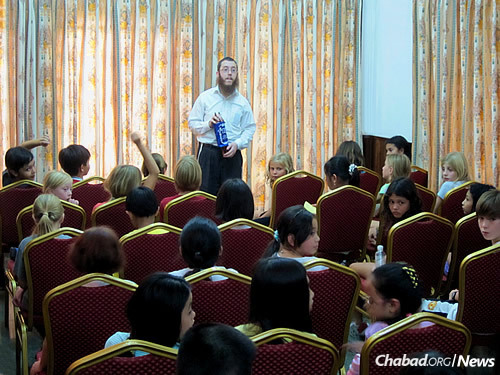 The rabbi teaches a Torah class for children. 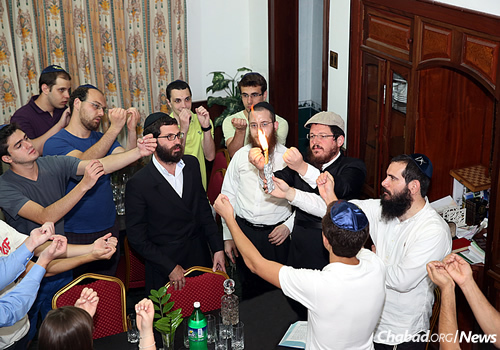 The rabbi begins to light the menorah at a Chanukah party.